A rogue skate park occupying a vacant lot on East College Drive has prompted complaints in recent weeks as local youth increase building activity. Sandy Burke, who lives in the 800 block of East College Drive, complained last week to Durango City Council about the activity underway at the old Boker Lumber & Hardware site at College Drive and East Ninth Avenue, at the base of Goeglein Gulch. Townhomes are destined for the lot, and plans will go before the city Planning Commission next month after years of haggling over specifics of the housing project. 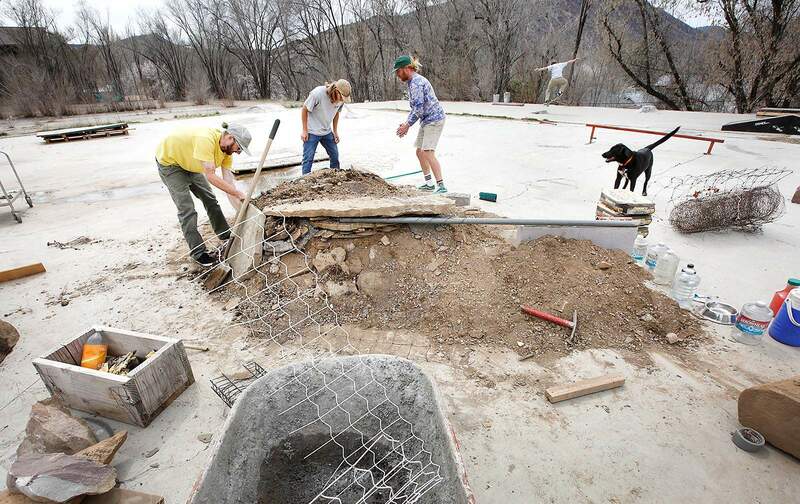 Though the skate park’s frequenters said the property owner, Steve Cadwallader, gave permission for the park, the townhome project developer, Tracy Reynolds, told The Durango Herald on Monday that no such permission was granted from either himself or the property owner. Cadwallader, who is based in Arizona, could not be reached for comment. If the townhome project is approved, the skate park will go. But until then, the industrious skaters are pouring concrete and setting up rails. With its concrete surface, the lot is a prime skating ground, attracting skaters for the past two or three years. It’s empty save for a few rails and, more recently, construction materials. A sign on Monday hung over some freshly poured ramps, asking skaters to keep off until the concrete sets. Burke said activity has escalated this year and gotten out of hand. Burke said she suspects alcohol use because of empty bottles and cans in the right of way, which is the hillside that separates the lot from East Ninth Avenue. She also complained of noise, including occasional loud music, skaters parking with their headlights on so they can skate after dark, defecation and urination near the area, and skaters using a neighbor’s outdoor electrical sockets to charge their cellphones. City Code Enforcement Officer Steve Barkley said he received a complaint about the park a few weeks ago, but found no violations. The city picked up trash last week in the right of way. If neighbors hear noise and loud music, Barkley said they should call Durango police when that occurs. An informal amenity on private property is tricky territory for the city. Burke said the property owner should shut down the park by removing the pavement, or else go through a public review process. The park is referred to as “the DIY” by its creators. One of the project’s orchestrators, Jeffery Hamner, was at the property on Saturday to build and said the skaters understand the project is temporary. He said the property owner had given permission for the park, though Hamner had not spoken personally with him. Jeffery Hamner runs up on a ramp Saturday put in place at “the DIY” skate park at the old Boker Lumber site near the bottom of Goeglein Gulch Road. Tucker Dunn, left, Morgan Burnett, center, and Jeffery Hamner build a feature Saturday in the middle of “the DIY” skate park at the old Boker Lumber site near the bottom of Goeglein Gulch Road.